We have a public running day on Sunday 24th April. The railway will be open from 12pm until 4pm. 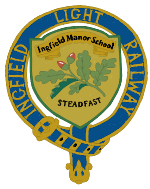 Ingfield Light Railway is located in the grounds of Ingfield Manor School, Billingshurst, RH14 9AX.